What Is Spinal Decompression Therapy? and how can it help my Back pain NYC. Chronic low back pain was a regular part of my everyday experience for almost three years, but I tried not to let it take over my life. I continued to work as an RN and stayed in shape at the health club. Then my back pain took a turn for the worst. I had trouble getting out of bed, getting dressed, and I couldn’t bend over to brush my teeth. I got an MRI and went to a board certified anesthesiologist. He gave me an epidural and a nerve block. Neither was effective. My pain began to rapidly worsen and I ended up at the emergency room. They gave me more shots and pain medication. With such a dense network of nerves traveling throughout the back, it is easy to see how a slight upset in the delicate architecture of the spine may cause great discomfort. Accidents and injury may damage discs and vertebrae, putting pressure on nerves. This results in tingling, numbness, muscle weakness, or even sharp shooting pain. • On any given day, 6.5 million people are in bed because of back pain. • Approximately 5.4 million Americans are disabled annually due to back pain. • Back pain is the # 2 reason for hospitalization. • Up to 85% of the U.S. population will have back pain at some time in their life. • After cold and flu, back pain is the number one cause of work absence. • Spine surgery is the second leading surgical procedure in America, with the total number in the U.S approaching 500,000 per year. • An estimated 93 million workdays are lost each year due to back pain. “For three very long years I had severe lower back pain. Doctors tried epidural, to no avail, and said I would have to learn to live with it. I’d been using a walker to get around and could not stand more than five to ten minutes without excruciating pain. My activities were very limited; I was unable to sleep in a bed for three years. After reading an article on Spinal Decompression Therapy, I decided to try it out.  Where Does it Hurt? The letters L1-L5 refer to the lumbar (lower) portion of the spine and s1 refers to the first segment of the sacral vertebrae. 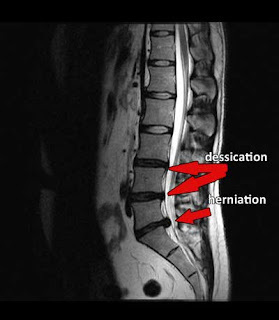 Over 90% of herniated discs occur in the lowest two levels of the lumbar spine, between L4-L5 and L5 – S1. The colors reflect the regions of the lower body potentially affected by compression of each given lumbar and sacral nerve root. Do you experience pain, tingling, or numbness in any of these regions?  What Is Spinal Stenosis?  What Is Degenerative Disc Disease? Phase Three: Stabilization-Further loss of disc height, disc space narrowing, moderate to severe endplate damage, disc fibrosis and the formation of osteophytes can eventually cause surrounding vertebrae to fuse together.  You have chronic or severe back pain caused by bilging or herniated discs, degenerated disc disease, sciatica, and/or facet syndrome.  You have been diagnosed with a clinically unstable low back.  You have failed back surgery syndrome.  You have been told to consider surgery.  You have sustained a recent vertebral fracture.  You have any retained surgical hardware (titanium rods or fusion cages).  You suffer from severe osteoporosis.  You have any rare conditions such as certain spinal infections and pelvic abdominal cancer. At the beginning of each session, you will be comfortably fitted with a pelvic harness designed to achieve optimal decompression of the lumbar spine. As a session of SD commences, you will notice a slow, gentle lengthening in your spine as your discs are gradually decompressed and relieved of pressure. This process is safe and relaxing. While some patients with extensively injured discs have reported mild discomfort during the first few treatments sessions, their discomfort subsides upon subsequent visits. A patient safety switch, or quick release clasps on the upper-body harness, provide an extra safety feature, allowing you to stop at any point should you feel discomfort. Each treatment session lasts approximately 30-45 minutes.